RETIRE IN STYLE BLOG: Pros and Cons for Snowbird RV Resort Living: When buying is still renting! Pros and Cons for Snowbird RV Resort Living: When buying is still renting! We own a park model in an RV resort. If you aren't aware, a park model is a cross between a trailer house and a RV. It is still movable and when we look under, the axles and wheel are resting on the ground. In the world of state law in Arizona the Park Model is classified as an RV. But on the outside it looks like a small trailer. We paid a registration fee when we purchased the unit and pay property tax on the park model each year. The cost of owning something like we have, for example, can be pretty daunting. While we did not pay very much for the unit, rent on property where we park our small park model came to $4400+ this year. This fee is due annually in a lump sum. And the rent has gone up considerably since we bought a few years ago. Last year it was $4200+. We also pay an extra monthly fees to the park for electricity and water for the washer/dryer. Apartment Therapy posted an article recently titled Life Lessons: Smart Tips for Determining the Rent you Can Really Afford. It caught my interest because many of the owners of park models in our park have come to the realization that they cannot afford to own here in the park anymore. We have a lot of For Sale signs in windows now. What I hear people who are selling say is that they could afford to buy the park models but the RENT for the land is pushing them out of this life style. In fact, when they do the math, they realize they can rent for the period of time they want to be here, save money and be free to go other places. So how much can you afford to pay to rent land for a Park Model you own? Or do you even want to do that? According to ApartmentTherapy, the financial rule of thumb for renting a primary residence is 30 percent of your pretaxed income. I am not sure I know how much of your worth you feel comfortable setting aside for a second home but I know it cannot be 30%, not if you are also making payments on a home in another part of the country. In many ways owning a park model is like owning land in that you must maintain the location year round and you are committed to paying the rent for the land. So I am going to apply the information available for real estate home ownership. Smart Money says that your total debt (including the second home) should not exceed 36% of your pretaxed income. By the time you reach the age when you begin to think about a snowbird nest, you may not think that 36% is low enough. We all know it is about your comfort zone. Doing the math when you consider this kind of a investment is important. But I believe you should also think about emotional and aesthetic considerations. You need to vet your decision based on what will keep you active and involved. Cheap is not always good but even spending a great deal of money on a place you are tied to will not guarantee your happiness. Always keep in mind what you want, what you can tolerate and how easy it will be to exit your decision. Getting in is very easy...getting out is another thing totally. There is no rent control. With proper notice the park owner can raise or lower your rent. You will have to pay rent or move your park model following proper procedure. If you do decide to move the park model, you probably will need to give the park owner notice much like you would if you had a lease on an apartment. Management of the park you live in is not under your control. They can make your time wonderful or a nightmare. You need to think of the owners/manager of the park the same way you would think about a neighbor. They have that much influence on your life. Talk to residents about the their behavior and management style. This is a proprietary type of business and the owners make changes on a whim. Our owner maintains the common areas of the park. We do not get a say in park's appearance. Even though we are responsible for our rental space, the owners in our park can tell us what we can and cannot do with the park model we own. For example, if we want to add a porch or an Arizona room, the owner has the power to allow or not allow this. They can even tell us what color we can paint the exterior. It is very like living in a community with CC@Rs. Those regulations appear in the rules and regulations of the park. We were bound to those when we signed our rental agreement. Most activities (at least in this park) are run by volunteers and will not be available without organizers. On the plus side, if you are interested in an activity, can get approval for it and want to do the organizing, you can call the shoots. Our owner provides facilities for recreation (at their discretion). Currently we have bocce courts, shuffle board courts, horse shoe pits, a net for golf practice, a pool, rooms for ceramics, metal craft, lapidary, quilting and two pickle ball courts. Our tennis courts have not been usable this winter (fence and carpet removed). Those people that played every day probably moved here because that activity was possible. I suppose they thought that it was implied that the tennis court would always be there. Not having it available changed their life this winter. 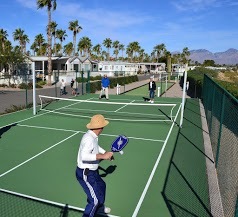 Since we purchased, we have seen the croquet area replaced with a pickle ball court. You need to realize that what you see may not always be what you get. Even park models need to be maintained...a worn out furnace, water heater or air conditioner can be very expensive. You may be allowed to sublet your park model but the park owners can charge a "guest fee". In the past we have paid $10 per day up to $1000 per year. We have always paid from day 1 when we rented our park model out. I do not know what the guest fee is now. You need to check on that information if you are wanting to rent your park model for part of the year to cover costs. Remember that park models and RVs are a lot like cars. Depreciation takes it's toll and getting even a portion of your original investment back when you sell is probably not going to happen. Go here for more information on resale value. Finally, be aware that visiting grandchildren or family can be restricted from using facilities like the swimming pool. Ask about the park policies. FYI: In the past the owners of our park restricted owners from selling their own park models. The units for sale could be advertised on a bulletin board in the laundry room with a small sign. The sign had to be approved by the the office. Owners could also list with the park's broker. Now we are told there is a law in Arizona that gives owners the right to sell their own units and display "For Sale" signs in the windows of their units (a no-no in the past). It was a big surprise for everyone. The lesson here is very evident: if the rules and regulations are in conflict with the law, the law always wins. Disclaimer: I do NOT guarantee that the information I have collected here will apply in your situation. Online searches are not the same as legal advice or even advice on real estate purchases. Check the facts and be very careful. Remember: It is YOUR money! Charging a guest fee for visitors. Arizona Statute 33-1414, item 5. We rented a park model in Tucson this year for the months of January and February. We paid $1950 a month to the owners. They have recently bought a manufactured home in the same resort because they wanted more space to live for the six months they spend in Arizona each year. The park model we lived in is for sale. The park fees are about $5k this year. The landlords were comfortable renting it out for just the three months of high season, to cover their park fees. We will be returning to the same unit next year, if it hasn't sold by then. We'll spend three months rather than this year's two. But we do not intend to buy a park model even if we spend every winter in Arizona from here on. We have three timeshares. They had an initial cost and now annual maintenance fees. They are very difficult to sell or even give away. We now have those fees to pay every year even though we'd just as soon not have timeshares. We have no control over the increases in the maintenance fees. When I think of buying a park model, I remember those timeshares. That said, we LOVE living in a park model in the winter. It is perfect for us. We LOVE the many activities, the friends we made, the sunshine. I know you have similar feelings about your park model in your resort across town. I originally intended to own a park model but the fees scared me off, along with the model's depreciation. We ended up buying an inexpensive condo in the Surprise close to Phoenix. The upfront cost was higher than most park models. The HOA fees are at 270 presently and the taxes are around 900. The roof, outside painting, water, trash and grounds maintenance are included in the HOA. We could rent out the condo without any fees involved for us but I doubt we will. Hopefully, we will be able to recoup the at least the cost of the condo when we sell. Thank you Denise and Linda...it is always good to get a lot of stories. It really does help people make better choices. That is not inexpensive, but at $366 a month rent still cheaper than the monthly fees in most RV parks or the cost to rent an apartment or condo. But, as you note, there are additional costs and fees, depreciation, repairs and so forth that only property owners have to deal with, along with little control over the environment. At one point we owned a cabin near Payson that was sitting on Forest Service land. At any point they could decide to not renew the 10 year land lease and you'd have to move the cabin or have it demolished at your expense. We decided to sell for a variety of reasons but as it happened six years after we sold the Forest Service did end the land leases. An expanded state road went right through the leased land. Some of the cabin owners had been there for thirty or forty years and lost everything. Not owning the land underneath you can be a risky proposition. Yes you are right Bob...$366 is not much in the scheme of things. We are not going anywhere and love our little park model. But I do think that people need to be aware of what they are getting into. The Forest Land lease is a prime example of what can happen anywhere in the United States when you built on rented land. What I hear in the park is a lot of complaints born of people assuming that they have control over things that they don't. It makes for an unhappy atmosphere. Hopefully, it will turn around...SOON!